The next instant, he turned his boat 180° and came after us. Gulp! Luckily his boat was a bit smaller and a monohull. And, the wind picked up which sent us (and him) flying in the right direction, at least for us. He kept up pretty well and actually shortened the distance between us in his pursuit. Now what? 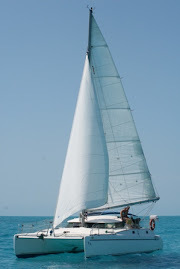 Mark was getting nervous and demanded the jib to be perfectly attended to while he took care of the main sail. While it normally doesn’t matter too much that our sails are trimmed to perfection, all of a sudden we were part of an important race. With the least change in wind, I adjusted the jib and Mark did the same with the main. Back and forth, in and out, slightly so. By this time, Irie had gained quite a bit of distance and our pursuer shrunk in size. He was still following and we contemplated sailing to our planned anchorage in Anse de Columbier, or making the already very long and tiring trip three miles longer by shooting for Ile Forchue. When we saw how busy Columbier Bay was, we chose for the rough, inhospitable but quiet island further away. We made it safely there, having shaken off our chaser, but we were kept awake all night by incredibly strong and loud wind gusts. Take note: you do pay a price for calling somebody and idiot, even when he is just that! St. Martin: Home away from Home?